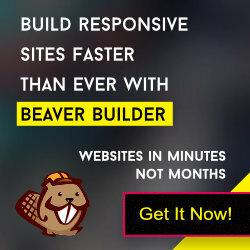 GBeaver Theme supports the inline logo feature. There is no recommended size option for it, which enables you to add full width logo which can resize smoothly based on your window size. Login to Dashboard and click on “Customize” link under Appearance Menu or at admin bar from front end. Click on “Site Logo” panel and upload a logo at Current Header section. GBeaver theme gives you a new feature which enables you to upload alternate logo for mobile devices. Just go to Theme Customizer page and expand the Site Logo panel. You will find Upload Alternate Mobile Logo section. Upload a mobile logo image and set the breakpoint (default is 768px). Click on “Save & Publish” button and save the settings. Once you have uploaded the logo, add the site tagline from Dashboard -> Settings -> General Page. Now navigate to GBeaver -> General Settings section and enable the “Show Site Tagline” option and set the position. And you are done! Please note that sometimes you may need CSS adjustment for better placement.